A team led by University of Colorado Professor Steven George, along with collaborators from the National Renewable Energy Lab and Colorado School of Mines, reported conformal ALD coatings onto highly porous flexible electrodes for Li-batteries, which improved battery capacity stability. These results are significant not only due to improved battery performance, but also because the coatings were made using a new “rotating cylinder” ALD reactor that allows continuous roll-to-roll processing, thus reducing the cost and demonstrating the scalability required in commercial battery production. One of the main challenges in developing this process was to ensure that process conditions in the new reactor are optimized sufficiently to conformally coat the complex network of pores in the flexible electrodes. To develop a better understanding of the effect of reactor configuration and ALD process parameters, the team has used flexible nanoporous AAO films on Al foil as a reference substrate. The nanopores in AAO are well defined and could be easily characterized to evaluate the uniformity of the ALD coating. 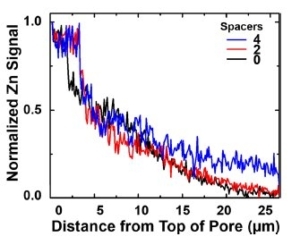 In this work, pore diameters from 10nm to 100nm and film thickness of 25 um provided aspect ratios overlapping the pore geometries in battery electrodes. AAO films were coated with ZnO to evaluate the role of reactor spacer configurations and ALD cylinder rotation speed. The EDS of the AAO cross-sections provided direct information on the uniformity of ZnO coverage as a function of both aspect ratio of the pores and reactant exposures. Spatial atomic layer deposition for coating flexible porous Li-ion battery electrodes.